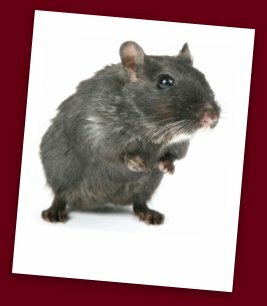 They might be cute to some people, but mice and rats usually create hazardous conditions for humans when they get into the food supply. Mice, rats, and other rodents are looking for two things: a place to live and food to eat. If you give them both, they will enjoy living in your home or building. As their families enlarge, they look for more and more food. As a result, they get aggressive – which can lead them to scavenge for more food, which in turn contaminates your food supplies. How does a mouse contaminate food? A mouse generally doesn’t bathe. As a result, the little critter carries with it any germs (like Salmonella and E-coli) it come into contact with, either through its food or through its environment. When it goes after your food, it leaves these germs behind for you to ingest. In addition, rodents have no bladder control. They are not house-trained; they answer the call of nature everywhere and on everything they run across. It transfers to their paws and to everything those paws touch… including your breakfast. Do mice brush their teeth with little mouse toothbrushes? (OK, enough with crazy the questions.) No! And when they bite into your bread or vegetables, they leave any germs that may have been in their mouths. Mice just can't get away from their germs - and have no qualms about sharing them with you. How can you tell if mice might be visiting you? One of the risks that mice bring can also be a way to spot them. Their droppings are a telltale sign. Black, slimy (if fresh), and about the size - though not the shape - of a sesame seed, these droppings can be found along the walls or under large appliances (such as refrigerators and ovens). A mouse likes to stay along the wall when searching for food or nesting material – it thinks it can always go back by turning 180 degrees and heading back to where it came from. If it is comfortable with the area, it may follow those walls and go wherever it wants to! So spotting droppings in your home can be one sign that you have some rodent guests. Another thing to watch for is damage to your food. A mouse who thinks there is food inside a cardboard box will chew through it completely until it hits that food. Mice also look for nesting material – soft things like towels or clothing which they can rip up and make into a nice bed for themselves and their family. Should you see gnawing on food boxes or food items, or towels that suddenly have holes ripped in them, you may have a problem. 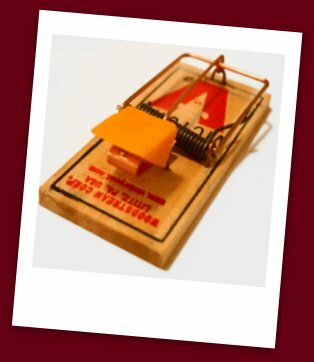 If you think you only have one or two, start by setting some traps. Your local hardware store may have traps that work for you. Use bait like peanut butter or cheese (Tom and Jerry come to mind) or a bait the store recommends for your situation. Setting one or two traps might take care of the problem. It is always best to clean up the droppings or messes that are left, spraying down the area with a good cleaner or bleach water to remove the smell, because the feces and urine leave a trail for other mice to find. On the other hand, if your traps are working - catching the pests in a day or so - but you still see fresh droppings, you might have a pretty big problem on your hands. It's best at that point to get a professional involved. You can redouble your efforts, but a professional might be the best option. Look for someone licensed and bonded, someone who will understand your situation and treat your property with respect. You don’t want an exterminator who will rip unnecessarily into walls and spray toxic chemicals in your home. How can you prevent mice from coming back – or coming in the first place? Start by looking at your home. Real mice don't live in Tom-and-Jerry-cartoon mouse holes; instead, look for cracks or openings in the foundation, garage or door frames. They are the potential mouse doorways, and they don't have to be big - about the size of a dime is all it takes. If you find any, seal them. Experts recommend steel wool for holes, since rodents can’t eat it. In addition, clean up any spilled food or garbage right away. Properly storing food off the floor and in sealed containers can also help keep mice from hanging around; if there’s no food to eat, they won’t want to stay.